Persian Cats CH Maxwell & Pretty Petulia welcomed their beautiful Persian Kittens born in the late evening Thursday April 27, 2017. This is their second litter and we are very pleased with the results. This was one of the easiest births ever, no complications or problems! 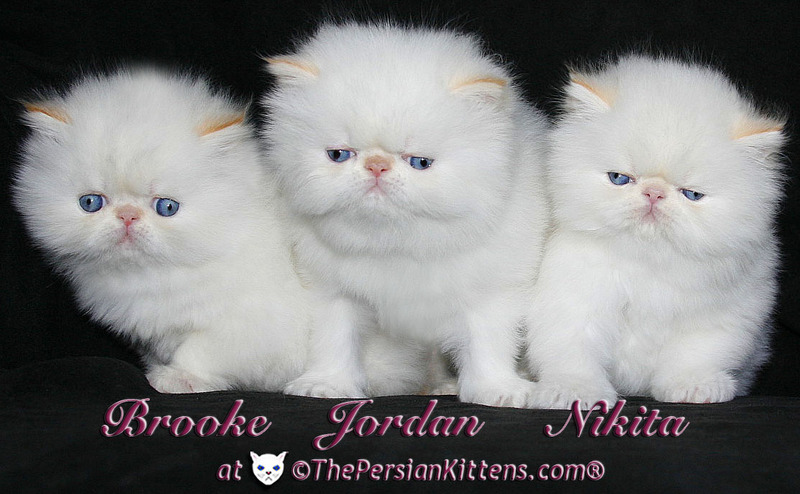 Our persian kittens are 2 Girls & 1 Boy, Jordan, Brooke, Harley, & Nikita. Their mini bios are listed below. All three ar Long Hair Exotic Cream Point Persian Himalayan Kittens. 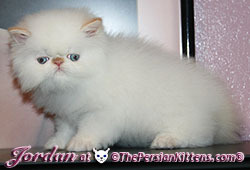 All three Cream Points kittens will be extremely light almost pure white persians with bright electric blue eyes. All three are the healthiest kittens we have ever had ! Petulia is such a Pro Mommie now ! With her first litter, she would lay on her side and the kittens were nursings wildly and Petulia would look up at me like"What should I do mommie? This time around she is super. She'll wake the kittens up and let them know it's time to nurse. She is keeping the kittens spotless. Now they're bigger, she'll tackle and hold them down between her two front paws and clean them as they squirm. She is an amazing Mother Cat. One of our Best. It shows. Her kittens are doing everything so well. I showed them once how to use the litterbox and that's all it took. They use the litterbox on their own. I put solid food and raw chicken in their mouth once and now they are eating on their own, although they still get Mommie's milk and are nursing constantly growing stronger every day. They are using the scratching post after I put them at the top of it and they had to hold on. All three kittens can be Champions. They are looking like their Grand Champion Grand Fathers on both sides. 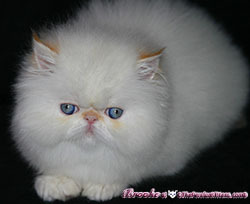 Daddy's side, GC BW NW Devanchire's What Dreams May Come a Flame Point Persian Himalayan. 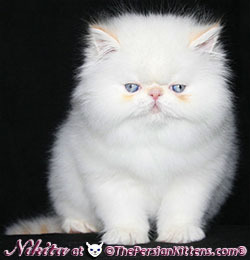 On Mommie's side, RW SGC CH Alfenloch Icing Sugar of Zinia a Flame Point Persian Himalayan. Each persian kitten page has their pictures and videos (click any thumb picture to get to the kittens page). If interested in Adopting on of these gorgeous kittens, please fill out out Newsletter/Adoption Form and we'll get back to you asap. Brooke is Available For Adoption ! Jordan is Available For Adoption ! Nikita has Been Adopted by Ted & Silviya & Family ! Copyright © 2018 The Persian Cats ® All rights reserved.